Can you remember the famous quote from Clark Grisswald's boss in the movie Christmas Vacation? His boss suspends Clark's Christmas bonus but realizes he made a big mistake. After, the CEO is kidnapped by Clark's slow thinking cousin and brought to Clark's house, where Clark and his family are celebrating Christmas, the CEO realizes how much his ddecision to suspend Clark's Christmas bonus hurt Clark and his family. He apologizes to Clark and his family and says, "A better bottom line is not worth it if you have to hurt the people who work the hardest for you. 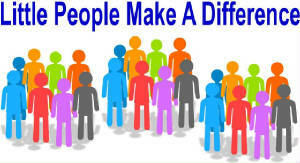 It's people who make a difference. Little people like you". I am one of the little people and there are millions like me. I try to do something good in my life every day with the hope that it will benefit me and others. Many little people like me share this view. Together in our own little ways, we make a powerful difference in our communities. After all, we are the people who elected Donald Trump to be our 45th President of the United States. While some un-evolved elite and rich people may belittle us, I have found that most of the powerful and rich people, who lead us, come from within the ranks of the little people. They were once little too. In their hearts many still have the goodness and grace that many little people own. Never be ashamed of yourself or your position or status in life. The goodness, grace and the respect you share with others binds this country together. Without your daily contributions to your families and communities our country would fall apart.